Once you find stock screeners with your personal “must have” features, the benefits associated with the nice to have and advanced features can make a difference. Take into account your personal preferences as well. Remember, screeners are stock screening tools and you are looking for the best tool for the job. Proprietary rating/ranking system – many screeners (Morningstar, ValueLine and Zacks for example) provide proprietary ranking systems that may improve the performance of your strategies. This is a good example of saving extra data with your results since it may not be possible for you to obtain the current rating some time in the future. Back-testing – even if only 1 or 2 years of data are available for back-testing, this is a convenient way to examine the recent performance of your strategies. Check for survivorship bias. Custom universe – if the process of ranking the stocks in the universe of candidates becomes part of a strategy, creating a custom universe can be a valuable tool. Importing a list of stock tickers – if you use multiple stock screeners, importing a list of tickers to get a special rating value or data point is a plus. Importing ticker lists relieves the tedium of entering the symbols manually. This list of tickers becomes a point-in-time custom universe. Custom universe screening – If you can create a portfolio or custom basket of stocks (a custom universe) you should be able to run a screen against this universe. For example, if you implement a strategy based on the work of David Dreman, you want to screen and rank only the mid to large cap stocks of the NYSE and the large cap stocks of the other exchanges. 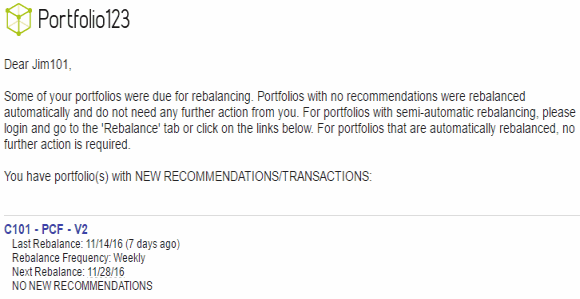 Even more important, you can apply a screen of sell rules against the current holdings of a portfolio. The notification below is driven by an automated simulation of a live strategy. It is set up so that I need to respond if a buy or sell recommendation occurs. Automation - Instead of you accessing the screener and running the screen, you can have the system run the screen on a pre-determined schedule. Notification - Screener sends you notifications about events, screen performance, or even renewal notices. Direct connection to an online broker - some screening sites now offer an automated link to place orders for the stocks passing your screens. Simulation is the ultimate screening concept. In stock screening, the goal is to run the screen looking for companies to buy. In other words - buy criteria. The downside of this is that anything that is not a buy is a sell. That is not necessarily a good approach. Simulation automates the process of determining what positions in the current portfolio need to be sold. It applies sell rules. Then it applies buy rules to determine which are the best candidates to buy to replace the positions that were sold. It is an extension of custom universe screening. Notice that this can be accomplished by saving the current holdings of the screen in a portfolio that can be screened. Then, a screen which identifies the rules which would cause you to close a position is run against the portfolio. Any company which passes this screen needs to be sold. The original buy screen is then run to find buy candidates.